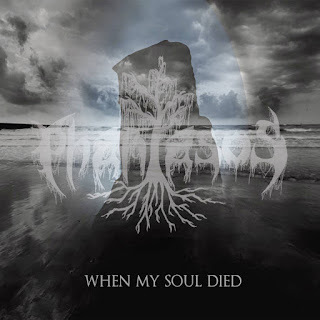 Phantasos are a solo project from Italy that plays an extracorporeal and atmospheric form of black metal and this is a review of his 2017 album "When My Soul Died" which was released by Vacula Productions. Clean playing starts off the album along with some melodic vocals a few seconds later while the solos and leads also use a great amount of melody as well as a brief use of thunder and rain sounds and some of the tracks are very long and epic in length and also mix in elements of post rock. Vocals are mostly high pitched depressive black metal screams while the riffs also bring in a great amount of melody along with a great amount of atmospheric elements being mixed into the music as well as some shoegaze touches also being used at times and all of the musical instruments have a very powerful sound to them, as the album progresses a brief use of acoustic guitars can be heard and all of the music sticks to a very slow direction. Phantasos plays a style of post black metal that is very slow, atmospheric and depressive sounding, the production sounds very professional while the lyrics cover dark, metaphysical and depressive themes. In my opinion Phantasos are a very great sounding atmospheric, post black metal solo project and if you are a fan of this musical genre, you should check out this recording. RECOMMENDED TRACKS INCLUDE "Lunar Wolf" and "Immpbilizationn". 8 out of 10.